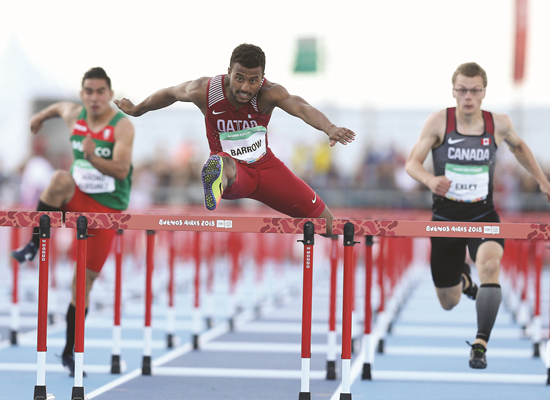 Qatar athletes Mohamed Abdelaziz and Owaab Barrow were firmly in contention for a gold medal at the Youth Olympic Games in Buenos Aires, Argentina on Saturday. After stage one of men’s 200m, Abdelaziz was on top of the standings as the 16-year-old set a personal best 21.10 seconds to win his heat. The Qatari youngster had 0.23 seconds over second-placed Antonio Watson of Jamaica going into tomorrow’s second stage. Watson is a sub-21 runner at his best: his and Abdelaziz’s second stage clash will be one to watch. The results of two stages are taken into account for final standings. Qatar’s Owaab Barrow in action at the Youth Olympic Games in Buenos Aires, Argentina, on Saturday. Barrow also recorded a personal best of 13.33 second to lead after stage one of the men’s 110m hurdles. Sharp from the gun, he flew through the middle section to record his lifetime best and earn a small cushion going into the second stage. Hong Kong’s Lok Hei Addis Wong was next best, winning his heat in 13.74, while Morocco’s Abderrazzak Mouzdahir and France’s Kenny Fletcher – fastest coming into the Games – both recorded 13.76 to lie within striking distance. Meanwhile, Mohamed Alqashouti failed to bring home a medal in the equestrian team competition. The 17-year-old was eliminated in the first stage itself. In the team event, Alqashouti had represented Australasia, which finished fifth.